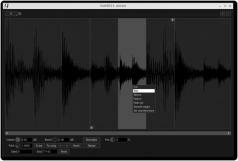 Giada is a reliable piece of software that makes it easy to create a variety of sound effects using existing audio tracks or newly recorded ones. The interface lets you easily access the knobs and switches included in Giada, plus you can create an unlimited number of channels, each with its own MIDI file or another sample in waveform format. It is also possible to edit the content of any channel via the right-click menu. Giada’s built-in editor allows you to normalize the file’s volume, edit the sample volume or boost the input. What’s more, you can set the start and end points, as well as edit the pitch. Various actions can be performed on a specific selection from the loaded waveform, such as smoothing edges, silencing it and fading the sound in or out among others. Giada also provides support for VST instruments and lets you use a variety of looping modes.